The cast of Carmen. Photo provided by Annapolis Opera. One of the most identifiable operas has to be Georges Bizet’s “Carmen,” which was first performed in 1875. The “Habanera” and the “Toreador Song” are two recognizable arias that even non-opera loving folks likely know. Inspired by a novella by Prosper Mérimée, the story follows Don José, a promising soldier, as he falls in love with the fierce Carmen. He abandons Micaëla, his childhood love, and his post to be with Carmen, who later leaves his for the torero, bullfighter, Escamillo. The story of the bitterness of jealousy is beautifully and energetically told in this production at Annapolis Opera. A good tragedy is told with moments of light joy, and this “Carmen” achieves that by not playing the end too soon. There were some lighthearted and downright funny moments. Director Fenlon Lamb built a beautiful world for this story and guided the audience through this journey without beating them down with sadness. ‘Carmen’ is a truly masterful opera and Annapolis Opera created a stunning production. The titular character was performed by Cassandra Zoe Velasco, a vibrant and fierce mezzo-soprano. Her performance was beautifully compelling and her voice was radiant. Velasco connected with her scene partners and the audience well and played the role of catalyst well. She drove every action with grace and strength. Don José was performed by tenor Frederick Ballentine. Ballentine’s depth of emotion and dramatic shifts of character were seamlessly justified and his robust vocal performance was stirring. Shannon Jennings was the sweet and strong Micaëla. Her delicate and nuanced performance combined with her huge voice to build an alluring character. Meroë Khalia Adeeb as Fraquita, Kate Jackman as Mercédès, Joshua Jeremiah as Dancaïro, and Ian McEuen as Remandado with Velasco performed the Act II quintet with so much joy. It was truly a delight to watch these five singers work together in a musically intricate moment. It was a true highlight of the evening and the characters that these singers created were so charmingly funny. Richard Ollarsaba was the iconic Escamillo with rugged sensuality. Andrew Simpson was Zuniga and Mark Wanich was Moralès. Lindsay Zetter choreographed the dances performed by Ashlyn Odenwald, Fern Holt, and Elizabeth Zarilli. The choreography was well done and accented the story well. Jefferson Ridenour designed the set. It used the space very well and created levels on the stage. Kris Kirkwood designed the projections. Lorraine vom Saal designed the gorgeous costumes. They were truly beautiful and there were many costume changes. Each one was indicative of what was happening and greatly set the tune for the scene and aided in the storytelling. 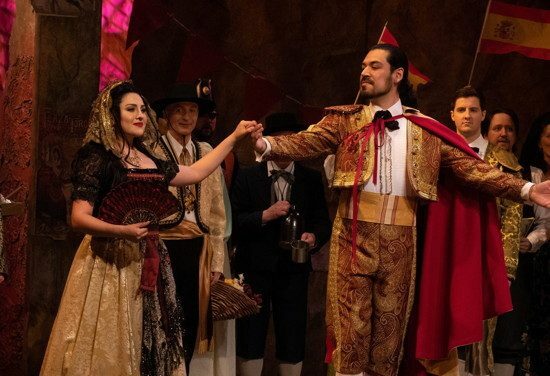 “Carmen” is a truly masterful opera and Annapolis Opera created a stunning production. It was so full of life and vigorous that the tragic end landed even more heavily. “Carmen” by Annapolis Opera performed at Maryland Hall for the Creative Arts. For more information click here.